Toddler Approved! 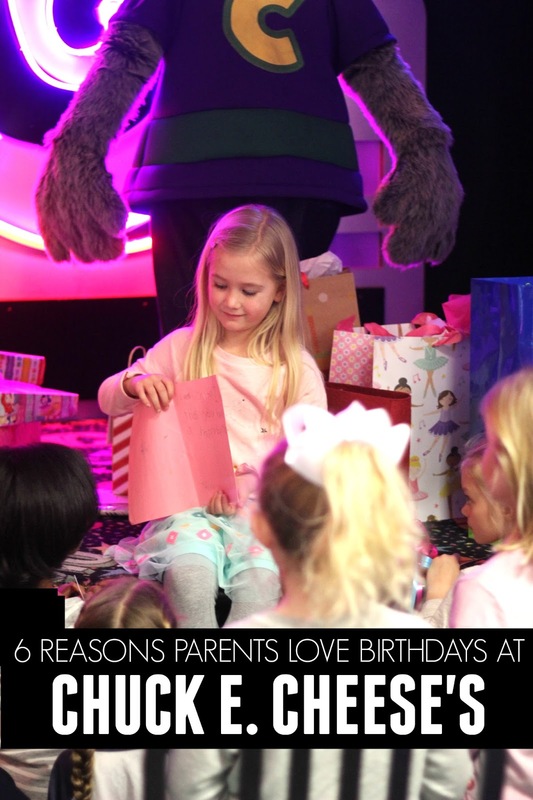 : 6 Reasons to Love Chuck E. Cheese's Birthday Parties! 6 Reasons to Love Chuck E. Cheese's Birthday Parties! We have birthdays in our family starting in October all the way until March. I love birthday parties, but they can also be exhausting. I am always looking for ways to simplify parties and make them more fun for me (and for the birthday child). This year my daughter had her 6th birthday party at Chuck E. Cheese's. This was our first Chuck E. Cheese's birthday party and I'm sure it won't be our last. It was such an easy experience. After enjoying our Chuck E. Cheese's birthday party and thinking about it in comparison to some other birthday parties we've hosted, I wanted to share 6 reasons why parents (like me) love birthdays at Chuck E. Cheese's. This post is sponsored by Chuck E. Cheese's. 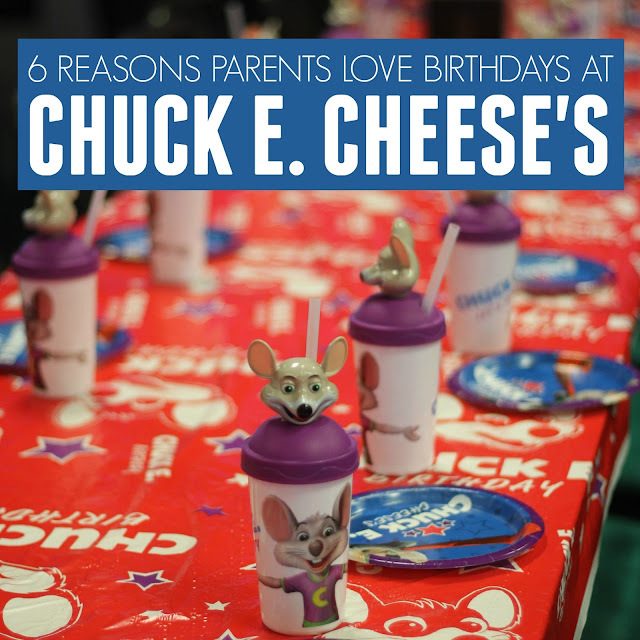 There are several other reasons I could add to this list... but here are 6 reasons parents love Chuck E. Cheese's birthday parties! 1. You can show up 10 minutes beforehand and everything is ready for your party! Our party host set up our plates/cups, reviewed our pizza orders, and had play passes ready for when kids arrived for the party! We had nothing to do once we arrived and put our cupcakes down... it was so relaxing that I almost didn't know what to do with myself. We had time to greet each guest and chat as they arrived, which was awesome! 2. There are cute birthday themes help you personalize the party to fit your birthday star! You can do as little or as much as you would like! Chuck E. Cheese's provides cute, simple birthday accessories for your birthday star that go along with the theme. You can have Chuck E. Cheese's do everything, or you can bring in a few of your own things to decorate! Either way, it is so easy! 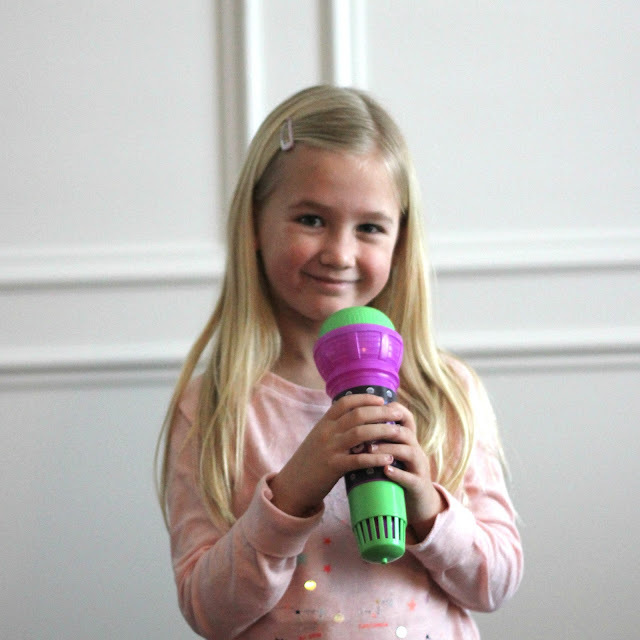 Some of the party theme choices include, “Party Like a Rock Star,” “Dressed in Pink Party,” “Sports, Sports, Sports” and “Chuck E. Super Fan.” My daughter did a "Party Like a Rock Star" party, so she got her own Chuck E. Cheese's microphone and I brought a blow up guitar for kids to take pictures with! We also made some rock star themed goodie bags with pop rocks. You can download my "You Rock" favor bag tags HERE. If you don't want to make your own goodie bags, Chuck E. Cheese's can do that too! It is awesome! Chuck E. Cheese’s also has brand new cakes with sweet frosting, rich cake and a splash of excitement with colored sprinkles! If your birthday star would rather have something homemade, you can bring that in instead! I love how accommodating they are at Chuck E. Cheese's! We made special rock star cupcakes and star cupcake toppers. Our host stored my cupcakes away from the party until it was time to eat them (to avoid little kids sneaking cupcakes too soon). You can grab our "Party like a rock star" star cupcake toppers using the link below. Just punch them out with a circle craft punch. 3. The pizza is really good! I am still dreaming about the BBQ chicken pizza. The sauce is delicious! We bought cheese and pepperoni for the kids and the adults dived into the BBQ and Supreme pizzas. Several of the parents mentioned that the pizza was really good! The kids kept asking for more, so I think they liked it too! I went home and ate the leftovers for dinner that night too. Yum! Check out the full Chuck E. Cheese's menu HERE. This was hands down the birthday girl's favorite activity... so it was mine too! The ticket blaster is a little booth that the birthday child goes inside and then tickets fly around and they try to catch them. Kids can even bring a buddy in to help them if they want. We opted for no buddies since we didn't want to make any friends feel bad. My 9-year-old son now wants to have his birthday party at Chuck E. Cheese's solely because he wants a chance at the ticket blaster! He thought it was so cool! 5. The mess stays there and you don't clean it up! The best part about partying at Chuck E. Cheese's is that once the party ends, you go home and your party host cleans up! It is so relaxing! There are no dishes to do, no decorations to pull down... you just carry your gifts to the car and head home to continue the celebrating. 6. Lots of time for taking pictures, chatting with friends, and focusing on your birthday star since everything else is taken care of! I spent my daughter's birthday party running around taking pictures and chatting with her friends and their moms. I wasn't worried about serving pizza, pouring drinks, or running any activities. The party host made sure that each of the kids got a play pass card for playing games and kept the food and drinks coming! I loved having time to snap photos of my daughter with her friends and just chat with them. Although I love to do crafty parties with art projects and other more creative components, sometimes it is nice to just focus on people and enjoy a low stress party! 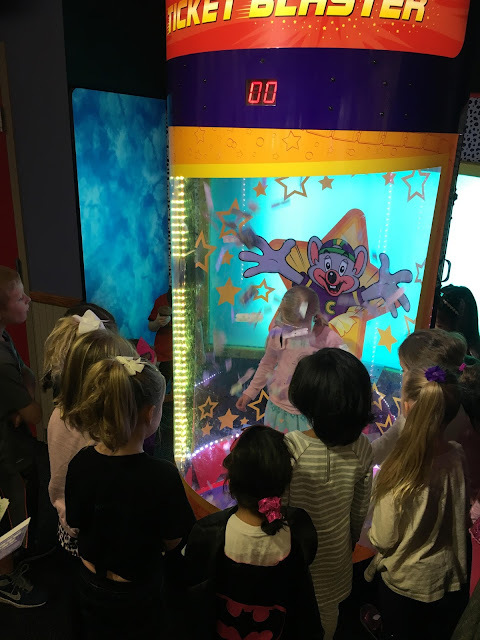 Our party at Chuck E. Cheese's was probably the most low stress party we've had for any of my kids! Chuck E. Cheese’s also has a new online reservation system that makes it easier than ever to book a birthday party. No playing phone tag with customer service. It keeps things nice and simple! You just reserve your spot and get a reservation via email within minutes! Simple! Birthdays can be stressful enough without needing to have the party get overwhelming! These tips will hopefully help you and your child have an enjoyable and mostly stress-free birthday. Have you ever hosted a birthday party at Chuck E. Cheese's? What did you love about it? Have any other reasons to add to our list? My niece had her family birthday party at Chuck E Cheese this past year. The kids loved it. I love the ticket blaster!! My kids would go crazy for a Chuck E. Cheese party- and it makes me feel all nostalgic because that's where I always wanted my parties as a kid! Not having to set up or clean up is amazing! I will definitely have to look into this for my daughter's birthday. Thank you for the recommendation. I just did a birthday party myself, and I have decided I will let the professionals help next time! This is so great to know!